Used as an alternative to cord or wire on traditionally styled frames. 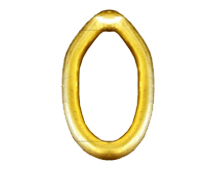 The chain is often sized to be displayed above the top of the frame on a decorative plate style hook. The effect is very distinctive.